If you are feeling tired and fatigued , Iron will help you by reducing those symptoms and contributing to a normal energy-yielding metabolism. Every day, you come across situations that demand quick thinking and a prompt decision. As it contributes to normal cognitive function, Iron is the essential mineral that can help you keep your brainready for action. Almost two-thirds of your body’s iron is found in haemoglobin, the substance in red blood cells that carries oxygen to every cell. In these cells, you can find the mitochondria. Commonly referred to as the powerhouses of the cells, mitochondria require oxygen to be able to convert nutrients into energy. By promoting the normal formation of both red blood cells and haemoglobin, and stimulating normal oxygen transport in the body, Iron helps you make sure your mitochondria get the fuel they need to produce the fuel your body needs. Therefore, iron also contributes to normal energy-yielding metabolism, as well as helping reduce tiredness and fatigue. Iron is found is many foods, however iron deficiency is a fairly common problem due to poor diet choices. 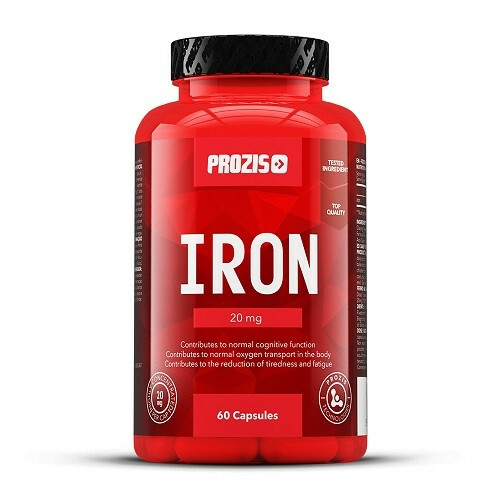 Prozis developed Iron to provide you with a high-quality source of this essential mineral. Each serving contains 20 mg of iron, meeting your daily iron needs with only one capsule a day. Kasutamisjuhend Take 1 capsule once a day with meal.